thematically organized with notes and discussion questions. Made possible by a grant from the National Endowment for the Humanities.  What motivated the Europeans in their initial settlements?  How did the European nations differ in their vision of a successful settlement?  How did they differ in the institutions they created to maintain their settlements?  What factors led to the survival or abandonment of a settlement?  What relationships evolved among European settlers, Native Americans, and enslaved Africans?  What did "America" signify to Europe in 1630? What did "Europe" signify to Native Americans and enslaved Africans?  What factors contributed to the permanent presence of Europe in North America by the mid 1600s?  How did Europeans adjust their cultures and institutions to create permanent societies in North America?  What roles did commerce, religion, geographic setting, population diversity, and cultural perspectives play in developing a stable colony? 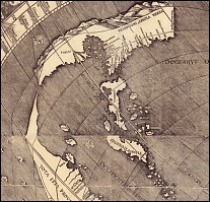  What did "North America" signify to Europe in the mid 1600s? Left image: Martin Waldseemüller, map of the world, Universalis cosmographia secundum Ptholomaei traditionem et Americi Vespucii alioru[m]que lustrationes, 1507 (detail: western hemisphere). Courtesy Library of Congress, Geography & Map Division. G3200 1507 .W3 Vault. 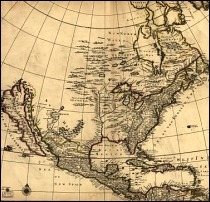 Right image: Philip Lea, map of North America, North America divided into its III principall parts, 1685. Courtesy Library of Congress, Geography & Map Division. G3300 1685 .L4 TIL Vault.